Spotify and Sony Network Entertainment International LLC (SNEI) have launched an exclusive music experience, making it easier than ever for gamers to enjoy their favourite tracks whilst playing their favourite games. That’s right, the best in music is playing co-op with the best in gaming. So whether you’re diving off Parisian rooftops, battling the evil of Crota or playing Barcelona at the Camp Nou, you’re in charge of the soundtrack. With background listening on PlayStation®4 (PS4™) system, you can soundtrack your gaming sessions with your favourite tracks. You might die a few times at the hands (or claws) of memorably terrifying monsters in the critically-acclaimed action RPG Bloodborne™, so why not do it to the music of your choice? Upbeat pop, thumping hip-hop, soothing classical…with over 30 million tracks, we’ve got you covered either way. Enjoy all of your favourite tunes on-demand. Pick one of your favourites from Your Music or Browse to find the perfect playlist for every mood and moment. We’ve even got a set of new gaming playlists for you. Spotify Connect lets you skip tracks or turn up the music using your mobile device or tablet, without ever having to interrupt your gaming experience. We know music has always been a big part of gaming and are excited to take the experience to a whole new level. With today’s launch, we’re bringing back that magic of gaming with music – all in a beautifully designed and smooth experience that looks great on your big screen. We have worked closely with PlayStation® to build an entirely new music experience which doesn’t just sound awesome, but also looks great on your TV and handles smoothly using the DualShock controller. 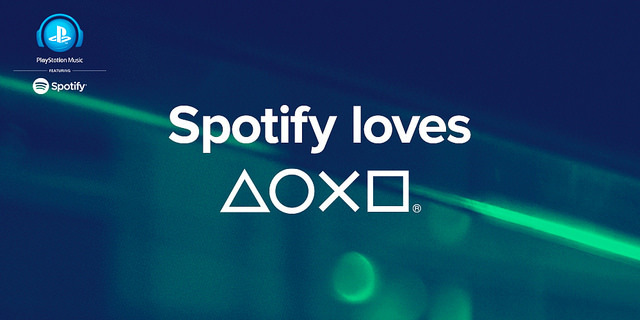 Spotify on PlayStation Music will roll out to PS3™ and PS4™ today and will also be available on Xperia™ smartphones and tablets. Ready to play? Get started at www.spotify.com/playstation.